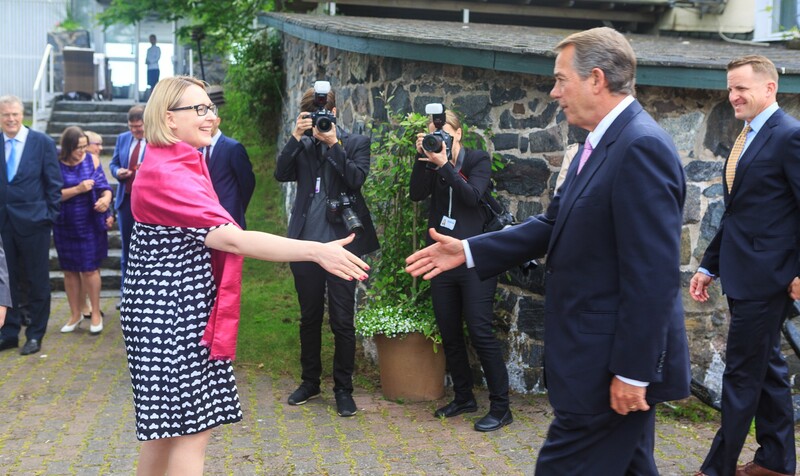 Maria Lohela is in her second month as Speaker of the Finnish Parliament. At 37, she is the third-youngest lawmaker to ever hold the position, and the first woman in nearly 90 years. On Tuesday, our delegation became her first diplomatic dinner guests. Maria Lohela, Speaker of the Finnish Parliament, is 37 years old and the first woman to hold the post in nearly 90 years. The daughter of a contractor and a nurse, the Speaker is a true representative of the Finnish people: sharp, insightful, and committed to making a difference. The Finns live in a tough neighborhood and maintain a careful balancing act amid Russian aggression. Our discussions with the country’s leaders were illuminating, and the importance of having stronger ties was clear. No dancing on this night — just some advice, one Speaker to another. When I saw she had a thick stack of notes for her toast, I told Maria that she ought to just speak from the heart. But mostly I told her to always remember we’re just regular people with big jobs. A big part of life is showing up and showing you care. That’s why our delegation came to Finland, because we’re all in this together, and we have a lot more to get through together.